Carrying over from yesterday, I got the cylinder cover holes drilled this morning. 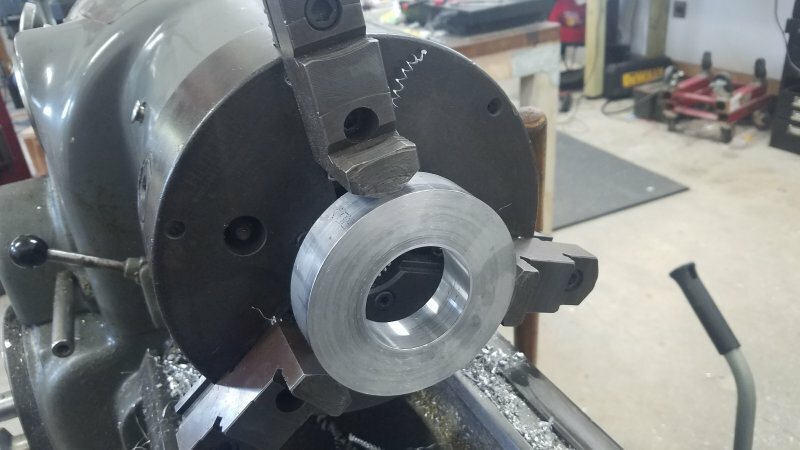 Since I want a good fit around the cylinder, I laid it out as follows on the bar so that the center hole could be accurately bored on the lathe. 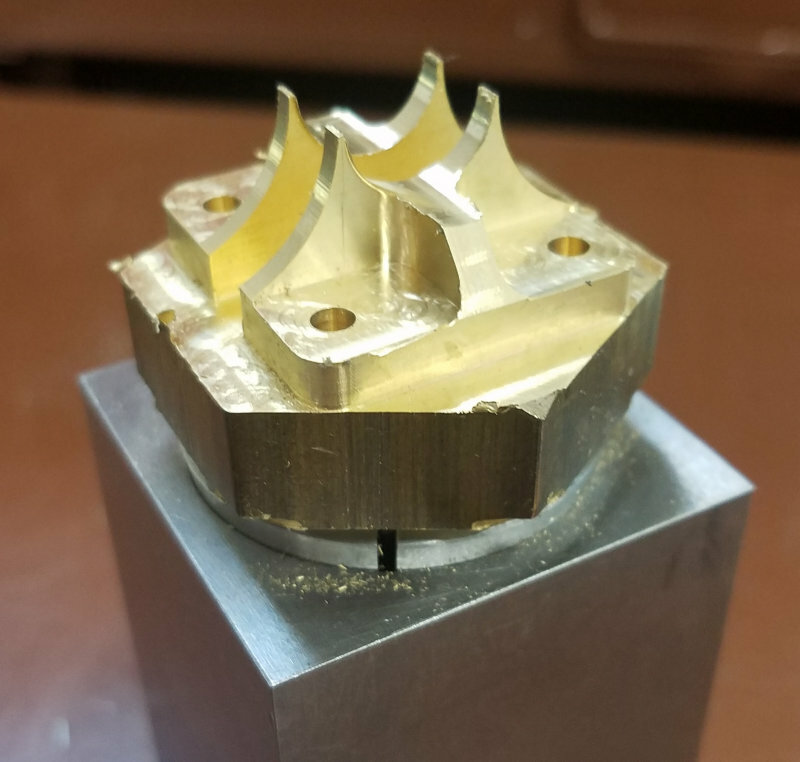 Started with 1/2" and 3/4" drills, then boring bar, with final passes at 5 thou until the cylinder could slide in securely. That bracket is quite complex, all is looking good! Pursuant to the idea to use powder coat instead of paint, I talked to my friend who has an offroad shop and does a lot of powder coat on parts. He has an extra Eastwood gun he'll sell me plus some powder to practice with and use of his oven. He showed me some aluminum with a powder that made it look like cast iron, so my plan is to do a bit of practice at his shop. 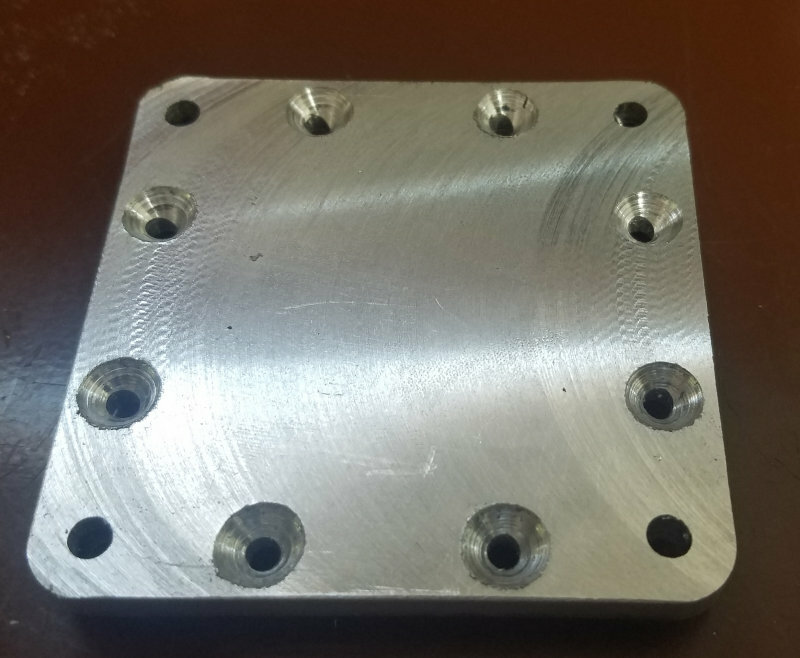 He also said that the powder coat will effective "glue" two parts that are just mated surface to surface quite securely; if so that will provide a way to fasten the port block to the cylinder. I'll need to do a test for air tightness. 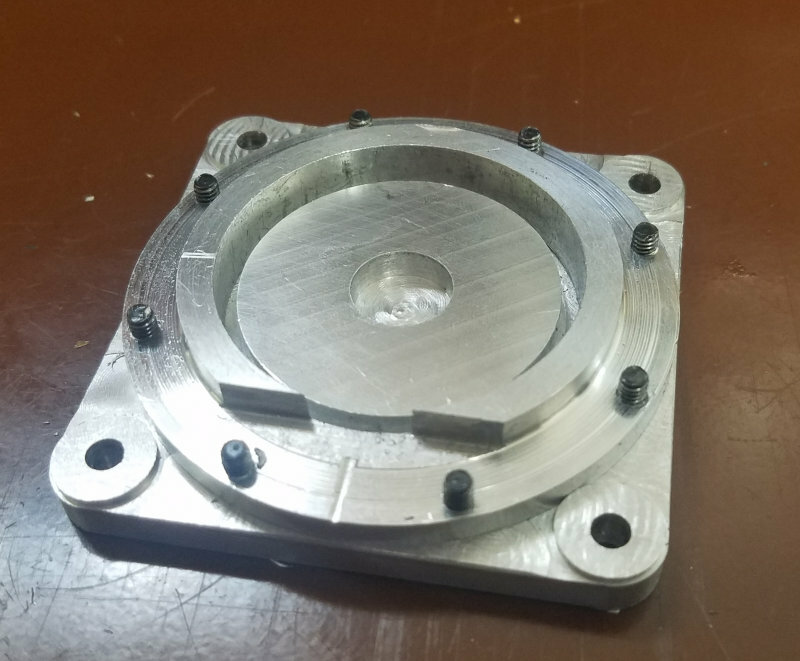 Craig, this is a part that I think would be a challenge on a manual mill. 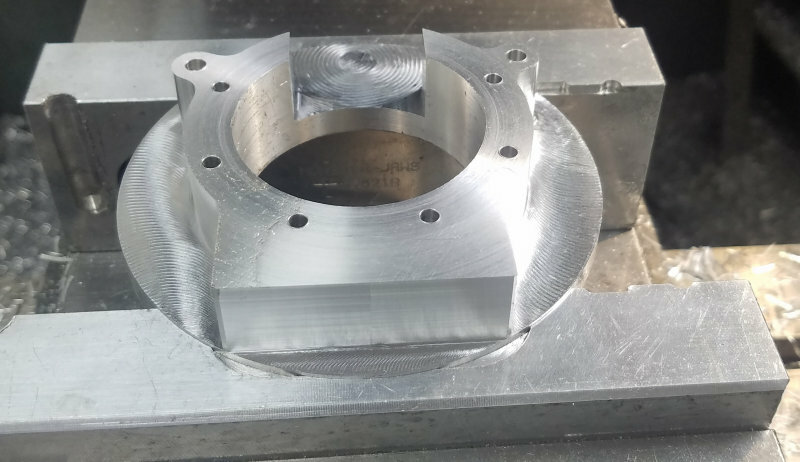 I spent all day on it today; 90% checking my CAM and workholding, and 10% actually milling. 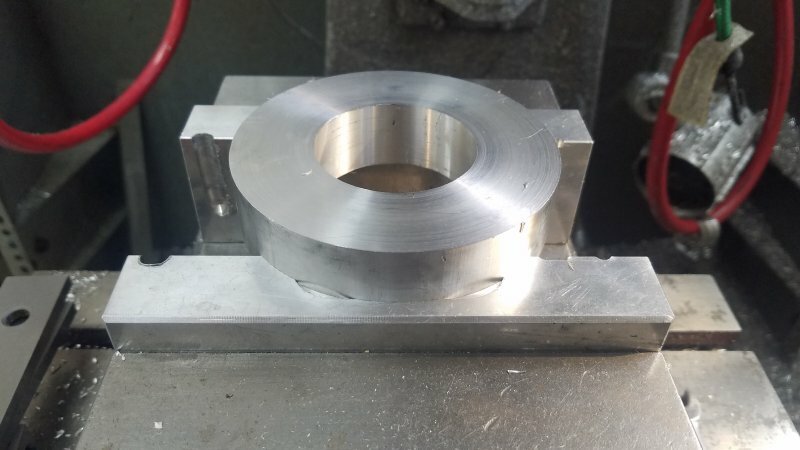 To hold the 4" round I briefly considered clamping it rightly on the vise (which probably would have been OK), but then decided to mill soft jaws for a more secure hold. Next some drilling followed by profiling to 17mm, 2 mm deeper than the finished part. Then back to the lathe, where I secured the work with the outside of the jaws in order to turn the part to 17mm. This was working well until the final facing pass when the work came loose on the jaws. 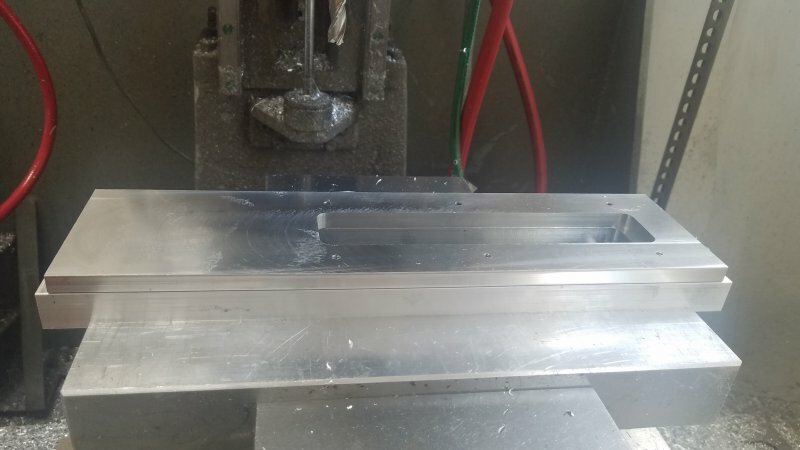 The aluminum had gotten hot and the hole expanded. No damage done, but off to the Bridgeport for the last pass with a face mill. Finally I needed to hold the part to finish the bottom lugs. Turned out milling the "arms" unsupported resulted in some whiny chatter, so I had to kludge up some supports. That was the last of the shop time. Still have tapping, drilling, and facing to final dimensions. Most aren't super critical. That looks great Kirk. I hope you will take some pictures of your adventures with powder coating too and share them with us. Looks like the nuke in one of those spy movies! Spectacular work Kirk, this project is really starting to take shape. 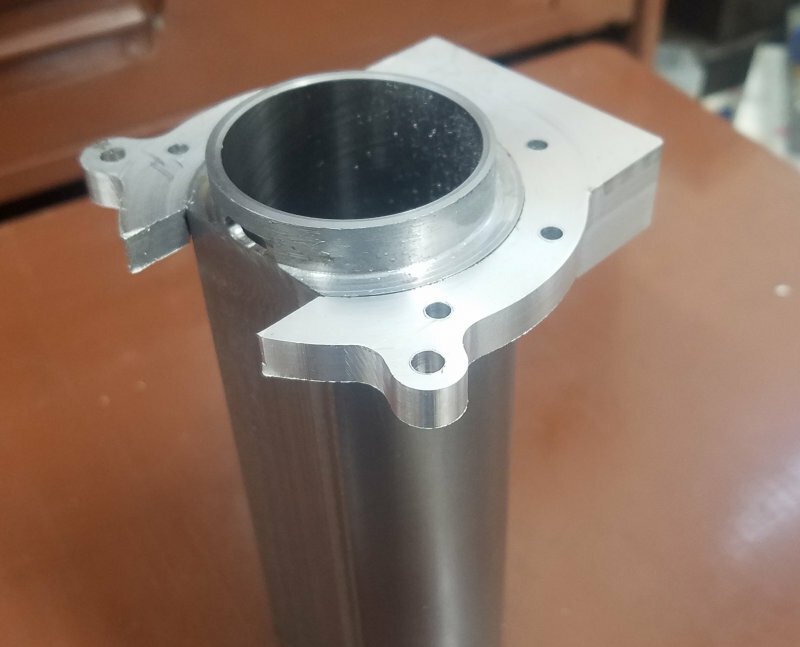 Today's part is the cylinder base, which attaches the cylinder to the engine base and also serves as the bottom cylinder cover. Carved out of a piece of Mic6 aluminum that started as ~ 3.5x3.5x.5". 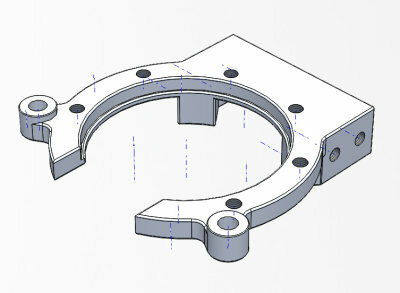 The 5-40 holes that attach to the bottom flange are counter sunk. 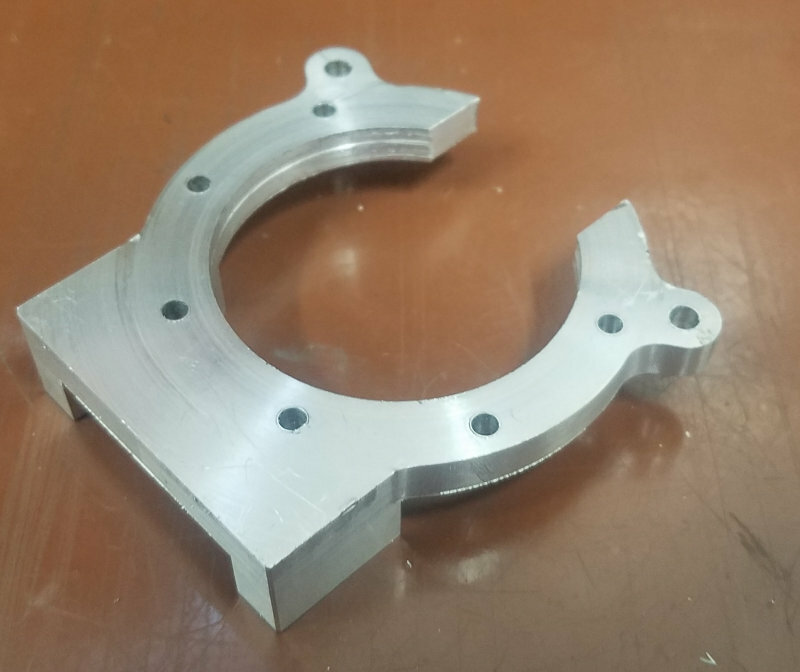 With the bottom flange attached. I'll need to buy shorter screws or shorten the ones I have. The material for the base showed up Monday, so I spent today on the first ops. It will be a composite of two pieces of aluminum bar bolted together. 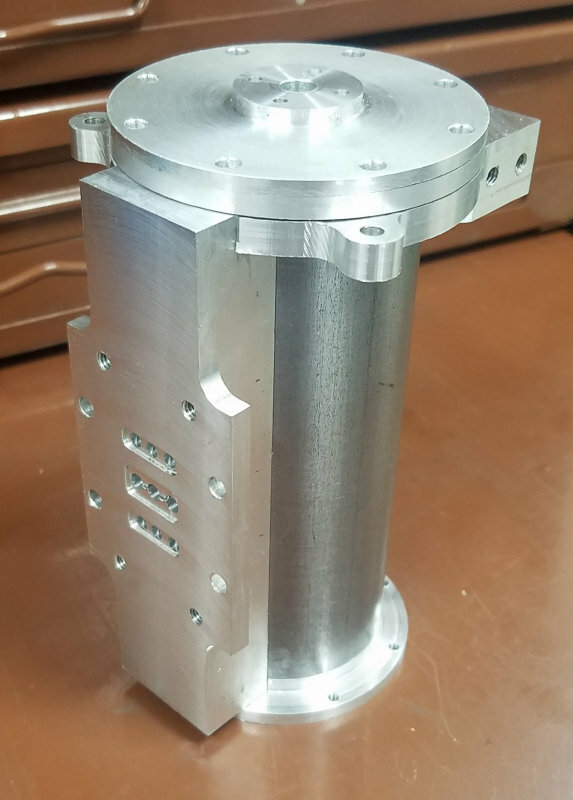 The bottom part is 6061 aluminum, 3/8" thick. The upper is 3/4" thick. The actual vertical dimensions are not critical, and this combination gives a total height pretty close to the metric height as drawn. Both are from stock 4x14". 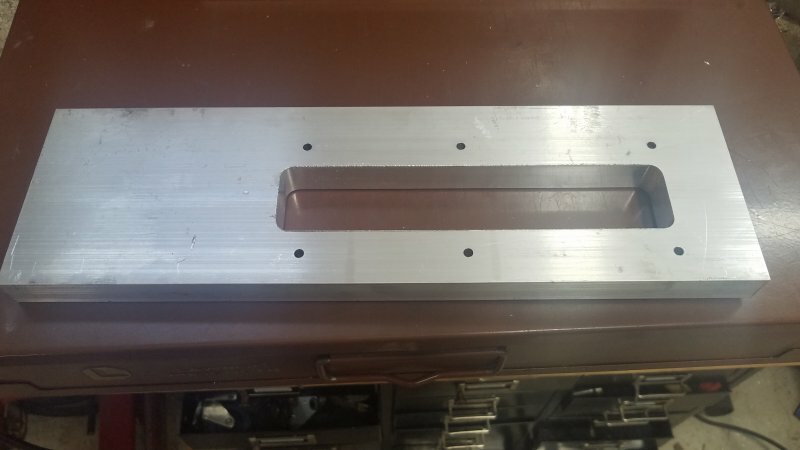 To hold these in the vise of the CNC mill, I mounted the 12" aluminum jaws and milled a fresh groove 3mm deep. These jaws got a good workout when building the Joy engine, so now it was time to reverse them and use the bottom. The two portions are attached by 6 8-32 screws. The holes for the bottom section are tapped. 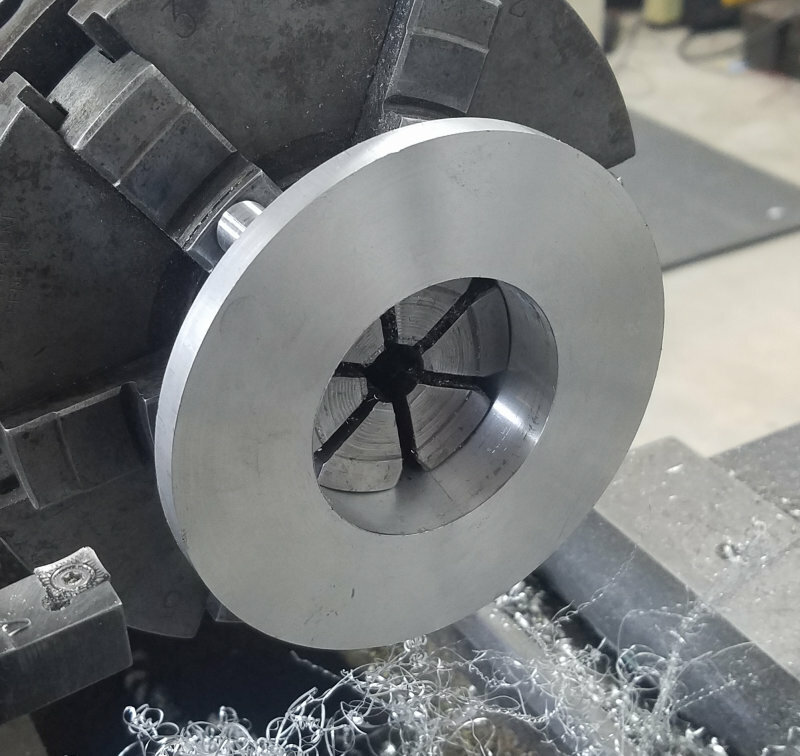 Not wanting to cut into the soft jaws, the outer perimeter was milled only halfway on the lower piece. 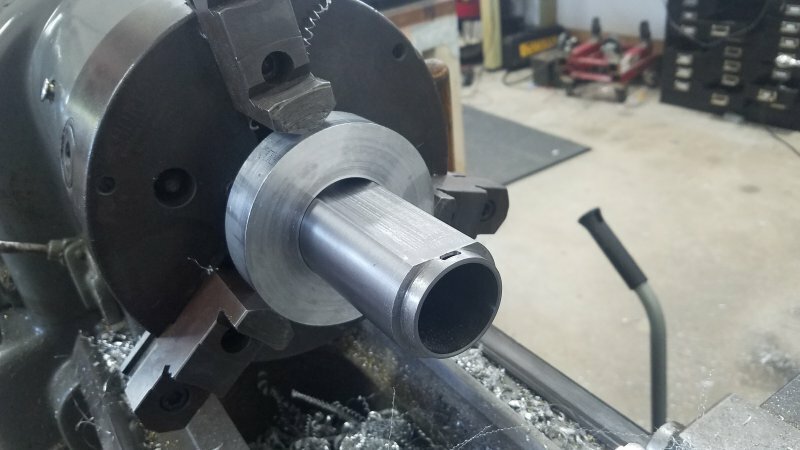 Then the upper piece was drilled for 8-32 clearance through holes and the well for the conrod was milled. Then the lower section was screwed to the upper to serve as a fixture to complete the lower's outer perimeter. That completed the lower section for now. Since the flywheel extends below the bottom of the base, some sort of plinth will need to be created for the engine to sit on. So the base may need some additional tapped holes for attaching that. I'll continue to work on the upper section the next time in the shop. 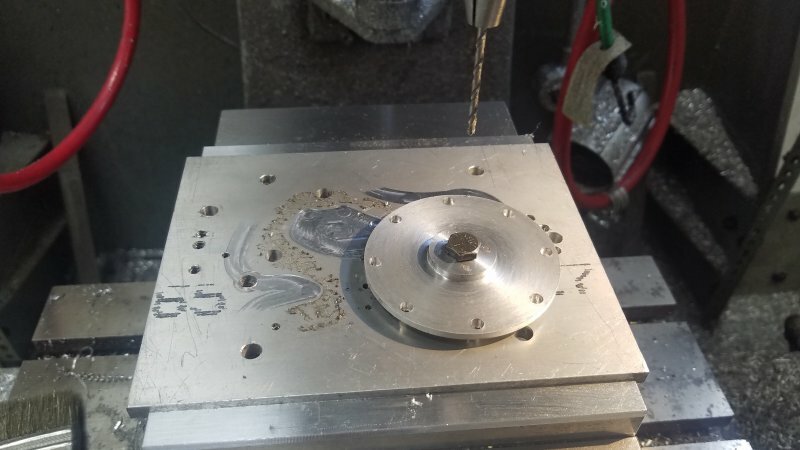 A few milling ops to finalize the shape and a good number of holes that'll need to be tapped. I had a pretty disastrous last two days in the shop. 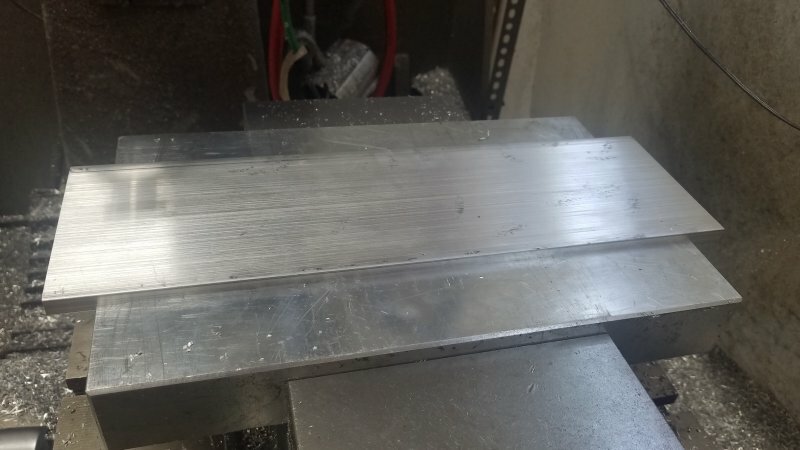 First I messed up my offsets in milling the upper half of the base and ruined the part, so I'll have to order another piece of 6061 and start over. 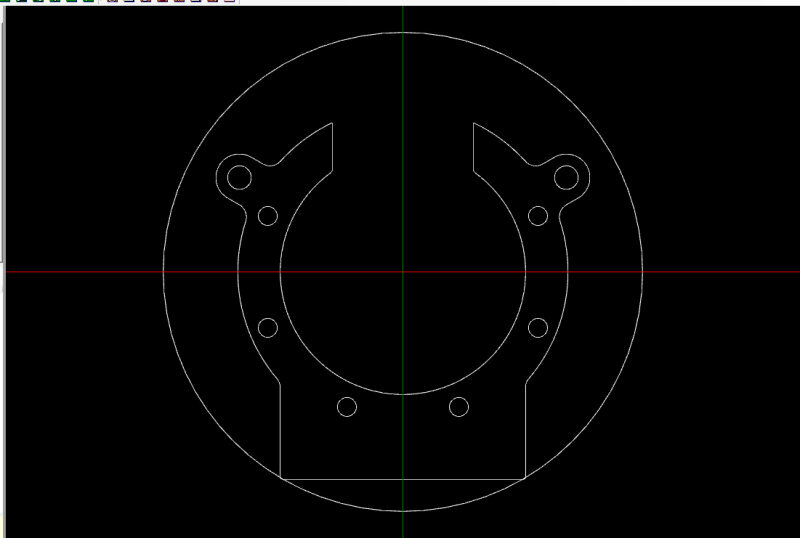 Next I managed to crash the sensor in my Haimer edge finder while using it to test the tram of my mill (finger fart), so that was $70 worth to replace both items plus the time I'd already spent on the base. So I decided to make a start on some other parts I'd been thinking about how to make. These "eccentric strap bearing brackets" support the cross rod to which the cranks for the eccentric and valve arm attach. Here's Julius' design from Solidworks. 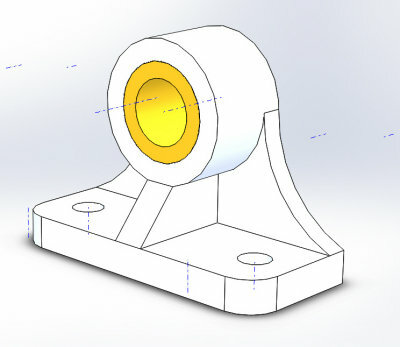 My idea is to machine all but the tubular part and then attach the bearing portion later. As it happens, two of these can fit inside a 1.5" hex rod. 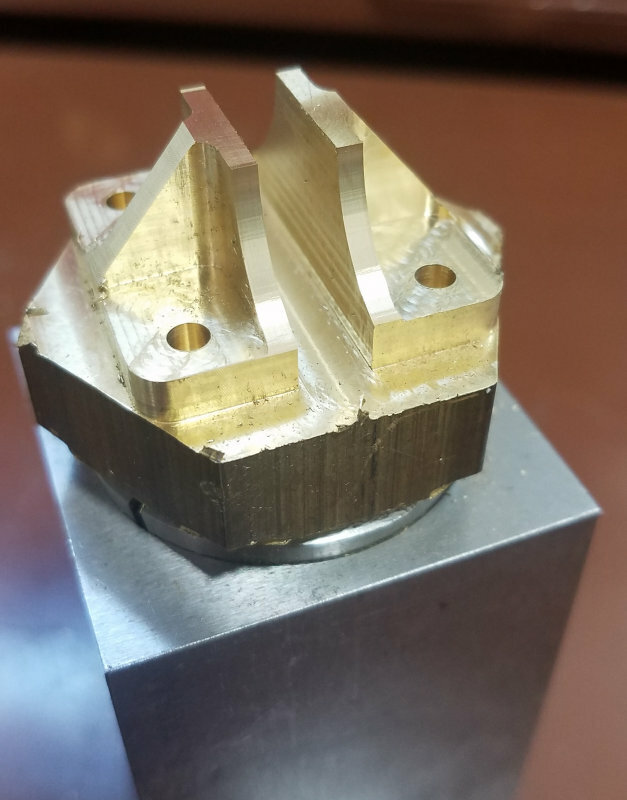 So I turned a spigot in the stock to hold with a 5C collet and collet block. 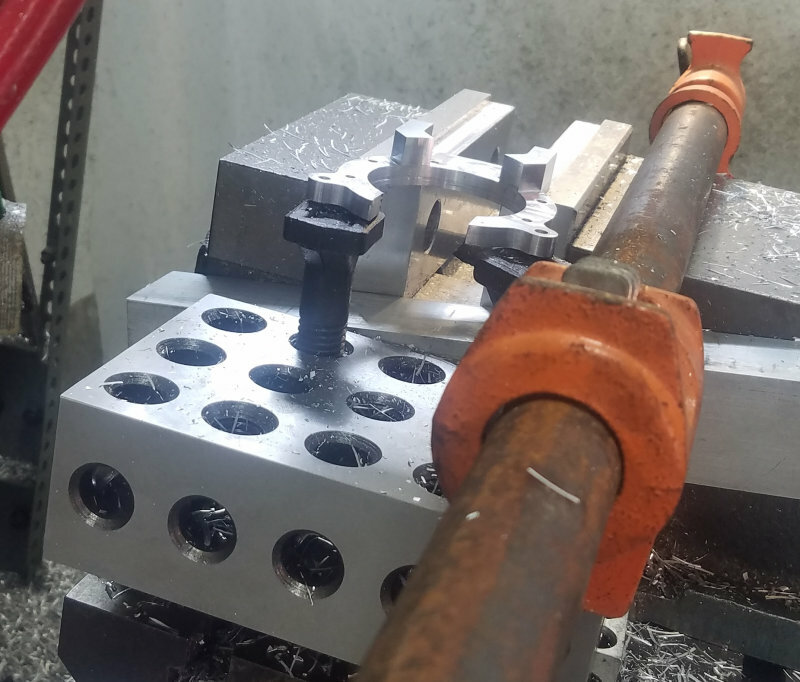 Then the first op with the block vertical is to mill the outer profile (7/32 endmill), inner pockets (5/32 endmill) and the 5-40 clearance holes. Then with the block horizontal, mill the side and front profiles. Finally, with the block horizontal, I used a 1/2" endmill to cut the profile for the bearing. Now it was time to part off and face the bottoms to proper thickness. And that's where I discovered my problem. 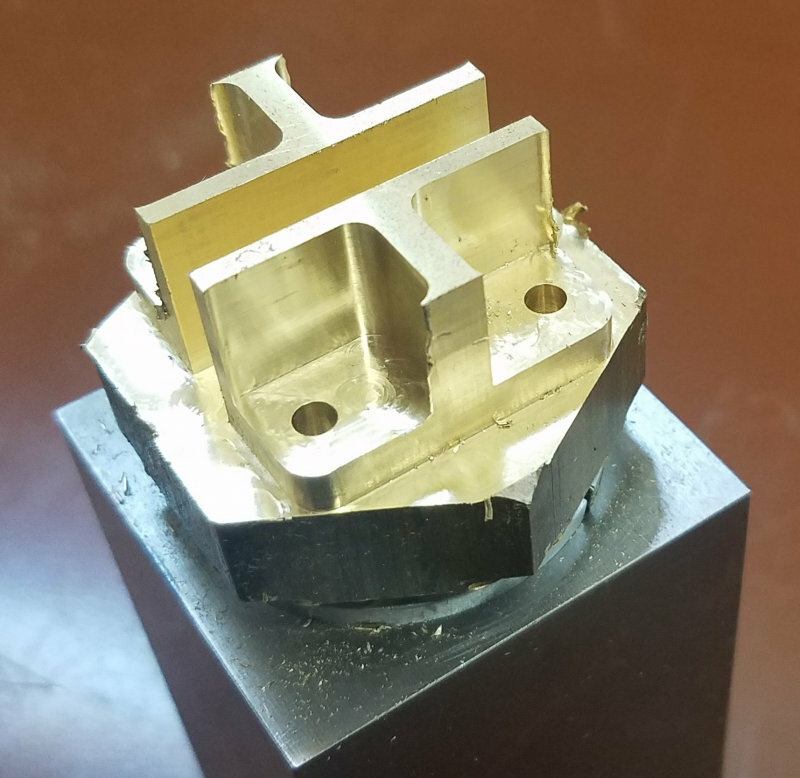 There's no good surfaces for clamping in a machinists vise. After struggling with this for a good while, I decided to loctite some 1/2" rod onto the tops, and see if it will hold securely enough for facing the bottom. 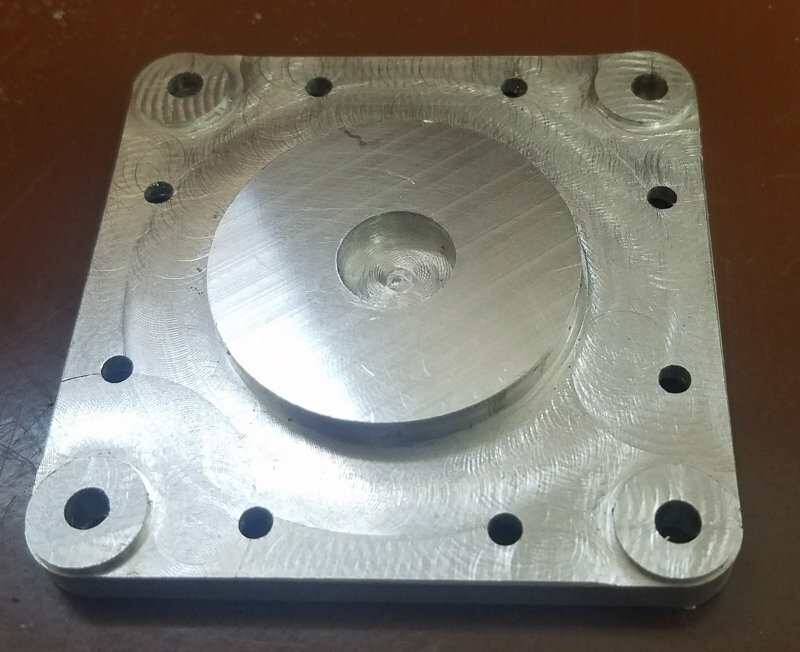 If I have to start over , I'll part off after the first machining op since I'll have flat surfaces for clamping in order to face the bottom. After that the parts can be screwed to a fixture place for remaining ops. Could you silver solder on the rod for the tubular part, maybe leave thay long, and grip there? Especially if the round was turned into some squared bar, so you can grip the square? Saw off to leave say 1/8" of the hex then I would have thought you could hold in the mill vice by the end faces as shown in red. Slip a thin packer between vice top and area marked blue so you don't cut into jaws as you mill the bottoms flat. I'd silver solder the round part on first as one piece to keep things lined up, if you try to do it as two pieces things are bound to move.